The rhythmic contraction of the heart is called heartbeat. A cardiac cycle is defined as a complete cardiac movement, including systole, intervening pause, and diastole. The cardiac cycle begins with depolarization of the SA node and atrial contraction. Each cycle requires a certain length of time for its completion. Pressure, volume, electrical, and sound changes occur during each cycle. Heart sounds are created primarily from turbulence in blood flow created by valves closing, not from contraction. Two separate networks of cardiac fibers regulate atrial and ventricular contraction. The heart is innervated by the autonomic nervous system, which neither initiates contraction nor affects the cardiac cycle. The conduction system is composed of specialized muscle tissue and initiates and conducts depolarization waves through the myocardium. Muscle fibers of the ventricular walls are arranged in whirls that squeeze blood out of the ventricles when they contract. The contraction phase is systole, while the filling phase is diastole. Atria contract while ventricles relax, and the ventricles contract while atria relax. In order for the heart to pump efficiently, the individual myocardial fibers must contract and relax in a coordinated, rhythmic fashion. This characteristic of the healthy heartbeat is called synchrony. Synchrony is maintained by the heart’s own intrinsic electrical system, which originates and transmits electrical impulses through a specialized conduction pathway. Just as the pulse is evidence of the heart’s mechanical activity, the electrocardiogram or ECG, is evidence of its electrical activity. In the absence of synchrony, myocardial fibers contract in a random, uncontrolled fashion called ventricular fibrillation and the heart can no longer pump effectively. If no oxygenated blood reaches distant tissues, the patient dies. Locations of the nodal tissue within the heart. The cardiac conduction system consists of highly specialized cells that histologically resemble nerve tissue. When the anatomic components of this system are affected by disease, abnormalities in the heart’s electrical activity called arrhythmias can result. The sinoatrial (SA) or sinus node is a small mass of tissue, about the size of a matchhead, located high in the wall of the right atrium near the entrance of the superior vena cava. It is the heart’s normal pacemaker, automatically initiating impulses at a more rapid rate than any other part of the conduction system. 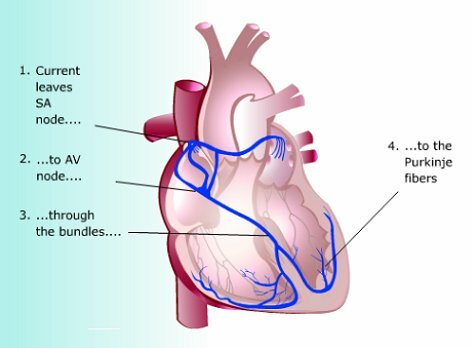 The atrioventricular (AV) node is also located on the right side of the heart, just beneath the surface of the interventricular septum. The AV node and the conduction tissue surrounding it are known as the AV junctional tissue. The atrioventricular bundle, or bundle of His, is a band of nerve fibers that originates at the AV node, then passes along the interventricular septum to the ventricles. Wilhelm His was the Swiss physician who first described this tissue. The right and left bundle branches are continuations of the bundle of His. They proceed along the right and left sides of the interventricular septum to the tips of the two ventricles. The Purkinje fibers (named after their discoverer, Johannes von Purkinje) are the tree-like terminal branchings of the right and left bundles-thousands of fibrils extending between myocardial fibers for about one-third to one-half the ventricular wall thickness. The heart muscle grossly resembles skeletal muscle, yet it is structurally different. Cardiac muscle cells are interconnected to form a syncytium, a multinucleate mass of protoplasm produced by the merging of cells. This permits electrical excitation waves to pass rapidly from one cardiac cell to the next. Cardiac muscle is controlled by physiologic mechanisms under involuntary control, and mediated by specific nerves. Automaticity: the ability to initiate an impulse or stimulus. The pacemaker cells of the cardiac conduction system spontaneously depolarize in the absence of external stimulation. The AV-junctional tissue and the His-Purkinje network also possess the property of automaticity. Excitability: the ability to respond to an impulse or stimulus. The cells are electrically irritable because of an ionic imbalance across the cell membranes. Cells thus respond to external stimuli from chemical, mechanical or electrical sources. Atrial and ventricular myocardial fibers respond to the impulse generated by the pacemaker cells of the cardiac conduction system by depolarization and repolarization. Conductivity: the ability to transmit impulses to other areas. Both the cells of the conduction system and the myocardial muscle fibers have this property. Contractility: the ability of cardiac cells to shorten, responding to stimuli with mechanical action. Myocardial fibers respond mechanically to electrical stimulation by contracting. The simultaneous contraction of bands of myocardial fibers is the heart’s pumping action. In order for the heart to pump efficiently, the myocardial muscle fibers must contract and relax in a coordinated, rhythmic fashion, in synchrony. When conductive tissue is damaged or deprived of oxygen, certain abnormal ventricular contractions may occur. Ansynchronous, random, uncontrolled contraction of the ventricles is called ventricular fibrillation. In v. fibrillation, the ventricle flutters and the blood cannot move out of the LV to oxygenate distant tissues. In cardiopulmonary rescue, a defibrillator is applied in the hope of shocking the heart back into a more normal rhythm. If a defibrillator cannot be used quickly, death follows. The property of cells of the conduction system to initiate pacing of electrical impulses independent of the autonomic nervous system is called automaticity. The SA node is the normal pacemaker. If the SA node is isolated from all neural or hormonal control, this specialized tissue can generate impulses at rates higher than 100 per minute. Under autonomic control, the SA node paces the heart at a normal rate of 60 to 100 impulses per minute. Other parts of the conduction system- the AV junctional tissue and the His-Purkinje network- also have the property of automaticity. The SA node is the pacemaker, if it initiates impulses at a faster rate than other areas and if the impulse is rapidly propagated throughout the conduction system. For instance, when AV node function is impaired, or heart block occurs at this point in the system, other cells in the ventricles may become secondary pacemakers-maintaining the vital heartbeat, though usually at a different rate. Thus, redundant automaticity is a protective mechanism that keeps the heart pumping even in the absence of normal impulses originating from the SA node. However, the ability of other cells along the conduction pathway to initiate impulses can create problems. For instance, when conductive tissue is damaged or deprived of oxygen (due to ischemia), it becomes irritable, and may cause certain kinds of abnormal ventricular contractions. Ventricular tachycardia is a particularly dangerous form of rapid heart rate that can easily convert to ventricular fibrillation -the uncoordinated, random contraction of individual myocardial fibers that stops any effective pumping action. The AV node is the only normal conduction pathway through the atrioventricular septum. When the excitation impulse reaches the AV node, it is delayed there for 0.08 to 0.16 second because of slow conduction along the delicate junctional fibers that connect the atrial myocardium with AV nodal tissue. During this delay, atrial contraction is largely completed, so that when the impulse reaches the ventricles, ventricular filling is complete. After passing through the AV node, the impulse reaches the bundle of His and again moves faster, passing through the right and left bundle branches and to the terminal Purkinje fibers in 0.03 to 0.05 second. The Purkinje fibers penetrate the ventricular wall from the endocardial surface, and only for a part of its thickness. From the Purkinje fibers, the excitation impulse then continues through myocardial cells outside the specialized conduction pathway, and a final 0.03 second is required to reach the epicardial surface. This rapid, simultaneous spread of excitation through the ventricles produces a coordinated contraction of both ventricles, thus ensuring efficient pumping of blood to the pulmonary and systemic circulations. 1. The heartbeat originates in nodal tissue high in the right atrial wall called the sinoatrial node, or pacemaker. Depolarization in the SA node is the event that sparks off a heartbeat. From there, the wave of excitation spreads throughout the muscles of both atria, which respond by contracting. The impulse passes through another mass of nodal tissue, called the atrioventricular node (AV node), where the impulse transmission is slowed. 2. The AV node is located in the floor of the right atrium near the interatrial septum. The AV node allows only 40-60 beats per minute to pass on to the ventricles. When the impulse reaches the AV node it enters a group of fibers called the AV bundle (Bundle of His) located in the upper part of the interventricular septum. This divides into right and left bundle branches, which innervate either side of the interventricular septum. 3. The terminal branches of the two bundle branches are the tree-like Purkinje fibers. When they reach the terminals of the Purkinje fibers they leap across to the cardiac muscle fibers and set in motion the molecular ratchets of actin and myosin, which slide past each other to shorten the fiber. The impulses relayed to the individual myocardial cells result in simultaneous contraction of both ventricles. All this happens in less than a second.